threatens your peaceful otaku lifestyle! Japan's quirky "Electric Town" to uncover fantasies made manifest. Feel the Beat of the Streets! fight to the beat of the music! home by eliminating monsters in a variety of surreal Delusionscapes! 03-05-2019 drakeshockfire Box Text Endless Adventure! An Enigmatic, pink-caped stranger has created a temporal loop that threatens your peaceful otaku lifestyle! Twisted Mystery! Explore a detailed recreation of Japan's quirky "Electric Town" to uncover fantasies made manifest. Feel the Beat of the Streets! Collect & Customize Power up each character's weapon with 100+ trading cards, and fight to the beat of the music! Restore Normalcy? Your ragtag group must save their home by eliminating monsters in a variety of surreal Delusionscapes! This is a list of VGCollect users who have Akiba's Beat in their Collection. This is a list of VGCollect users who have Akiba's Beat in their Sell List. 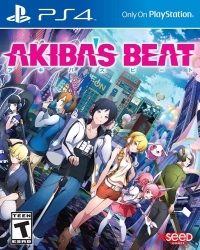 This is a list of VGCollect users who have Akiba's Beat in their Wish List.